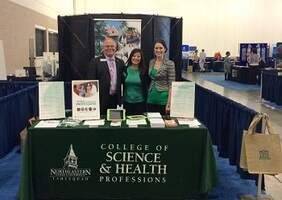 Pre-Health Professions at Northeastern State University prepare you to be a competitive applicant for health professions programs. A wide variety of educational, research, leadership and volunteer opportunities, plus a comprehensive advising system enable our students to sharpen their competitive edge. Students preparing for careers in medicine, dentistry, optometry, podiatry, chiropractic, and veterinary medicine eventually receive graduate degrees, all requiring a strong background in science. While satisfying the requirements for admission to a professional school, you will also be meeting requirements for a baccalaureate degree. Professional schools do not recommend any particular major but encourage you to choose a broad general curriculum in social sciences and humanities, and to achieve a high level of competence in the mathematical, physical and biological sciences. Most graduate health professions colleges require four semesters of chemistry, two semesters of physics, three semesters of biology, 2-3 semesters of English, and a standardized examination prior to admission. Students preparing for allied health careers (dental hygiene, nursing, pharmacy, physical therapy, occupational therapy, medical imaging and radiation sciences, and physician associate) may enter their chosen profession after completing 60-90 hours, including the prerequisites for the specific program (except physical therapy which requires a baccalaureate degree). Allied health preparation usually consists of undergraduate credit hours weighted heavily with mathematical, physical, social and biological sciences. You should also be satisfying requirements for a baccalaureate degree while meeting the requirements for admission to a professional school.